The West African Examinations Council (WAEC) has revealed that some 316,980 candidates will be writing this year’s West African Senior School Certificate Examination (WASSCE). Ms Jemima Vanderpuije, Acting head of Text Administration Division, who announced this at a media seminar, said 946 schools have so far registered for the exam which would be superintended by 946 supervisors. 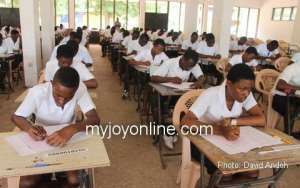 In 2017 and 2016, she said, 289,207 and 274,255 candidates respectively sat for the examination adding that with the introduction of Free Senior High School, the number of WASSCE candidates would increase. Very Reverend Sam Nii Nmai Ollenu, Head of National Office, WAEC, said this year’s WASSCE would be held in April instead of February due to calls from government and other stakeholders. Rev Ollenu said the government has absorbed 100 percent payment of examination fees of candidates writing this year’s BECE. Mr Carter Kofi Osafo, Acting Head, Test Development Division of WAEC, said it has commenced the use of Electronic marking (E-Marking) for some subjects on a pilot basis in the country. He said this forms part of strategies being implemented to curb examination malpractice. Mr Osafo said the benefits of E- marking, which includes saving time and being reliable and convenient, far outweighed that of manual marking and the Council will be replicating e-marking across the country very soon. Mr Osafo said Ghana drew inspiration from Nigeria where e-marking had been introduced. He said the council has also introduced Item Differentia Profile Software to avert cheating and malpractices. Mr Osafo called on the media and other stakeholders to help protect the integrity of Ghana’s educational systems and credibility of certificates issued by WAEC for use in the sub-region and beyond.